People often say that archives are were political movements go to die. However the process of archiving radical political material is not have to be about collecting material that will not just go into the vaults of history. Instead an archive can form a counter-narrative to histories of the state and capitalism as well as becomes political resource that is active in the present. 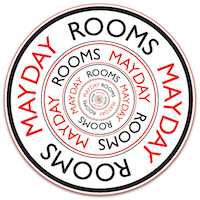 This guide has been collated in response to some of the archival practices we engage with at MayDay Rooms in London. We will cover, collecting material, forming a catalogue, creating metadata structures and creating a small shareable library on the Mazi. In the workshop, groups can be guided through these different stages with archive training and points of discussion. 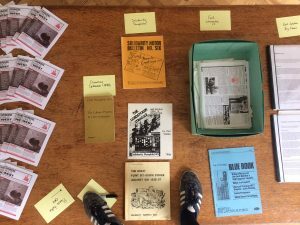 Recently, when collecting material for a new archive on housing struggles we started the process of collecting with an open meeting where different housing groups could come and discuss what they thought an archive should look like, and how the material in it can form a political resource for the movement. The collection of material does not have to be an individual exercise but one that can be a collective process shared by the group. Often this is also a useful exercise in thinking though a groups history; the tactics used, points of victories and defeat and how these are shown through the material. 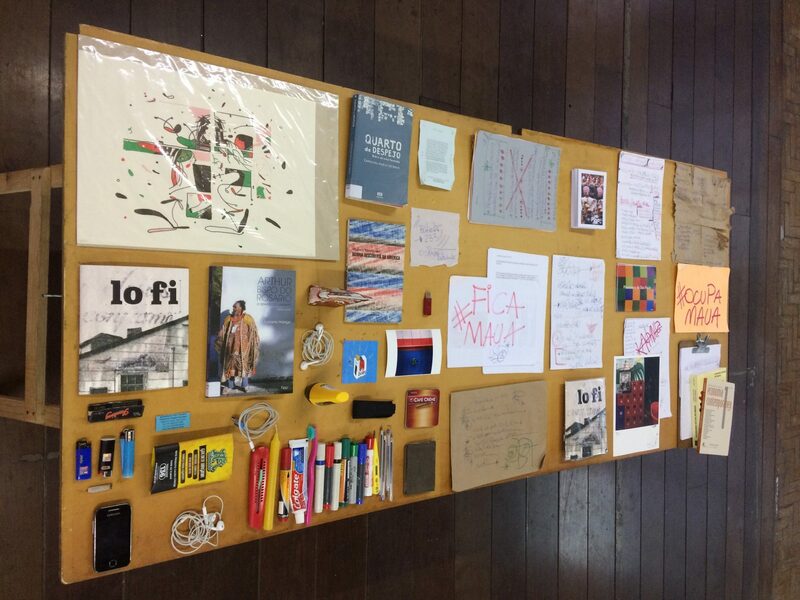 Radical archiving is not about collecting everything it’s about movements choosing how to document their own histories in light of the current political moment. How can we think about this in relation to a movement capacity to document itself and what is of contemporary relevance? Should we only collect public facing material or is it important to also archive internal documents. How can avoid archiving material that could incriminate fellow comrades in the eyes of the state? 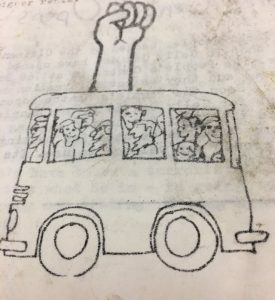 How can archival material that can be used as a political resource to other campaigns and movements? Once you have you material it will need to be sorted into collection this will help others navigate the material and understand its origin. In the majority of cases, new materials deposited will form a new collection, often formed around a group or a person. Most often these are held under the groups, movement of Campaign’s name (see Wages for Housework scans). Collections should then be grouped in a folder or box and an index of the contents created. This will then turn into the catalog. In some cases a collection is formed from material that has belonged to someone who was not part of its production. In these cases a decision must be made whether to keep the materials together under the depositor’s name, or to split them into collections based on the content of the material, eg Housing struggles. When a new collection is created a paragraph is written about the material and the history that its holds, this will further help people catalog the collection. Please see guide to Calibre for training on how to use this cataloging software. Here are some points to discussion for creating custom meta-data categories that will assist in the documenting of a groups/ movements history. Remember thinking about meta-data is not just an academic exercise but one that helps an item my accessed, disseminated and which links it up with other similar material. Because of the nature of the material involved in social movements, many of the items do not have an author. For this reason it is very important that items are cataloged to the correct collection. Where possible we enter details of Item Name or Title, Author or groups , Collection, Media type, Publisher, Date. 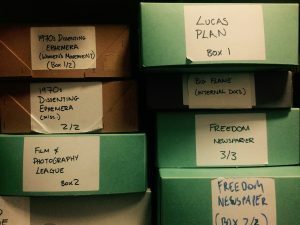 An archive contains a number of collections that cover broader periods of social struggles, for those items that do not easily belong to a collection. At the Mayday Rooms archive this is mainly labeled “Dissenting Ephemera”. There collections can also be created around an items format such as collections for pamphlets or political posters. Associations with different groups and organisations. Question: Can you think of any other meta-data categories that would be specifically useful to the Sao Paolo context? At MayDay Rooms, we encourage that public facing items such as campaign material or publications are copied, reproduced and disseminated as widely as possible. Digitisation might seem like a long, costly and laborious process, but it doesn’t have to be! 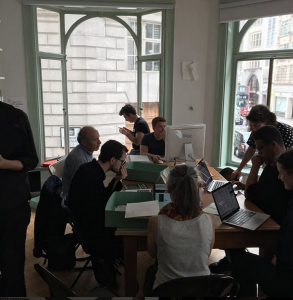 We have been running monthly scan-a-thons are the archive when we make lunch and people use open-source scanning apps on their phone to collectively digitise different archival collections. Smart phone Apps such as Text-Fairy are free and open source in android phones. For cataloguing and hosting digitisations, we use Calibre to build our main catalogue. We also work closely with platforms such as aaaaarg.fail and memoryoftheworld.org to host selected scans. This is done in solidarity with their work against academic paywalls and intellectual property.